These eco nuts, as they are named, are actually berries that grow on a tree. These berries contain a natural soap that cleans laundry really well. The Eco Nuts brand is an organic certified and award winning eco friendly laundry detergent option . The eco nut berries are picked from the tree, de-seeded and sterilized for consumer protection. The Eco Nuts brand are the only laundry berries on the market that are both, de-seeded and sterilized and done so organically so's not to compromise the products green label in any way. I saw this product on television and knew I had to dig deeper to learn more about this product as I'm all for being more environmentally friendly. I've looked into it and found this company to be the only one best preparing the nuts for laundry without compromising the organic process. To my surprise the eco nuts really work, they can be reused over and over. I have artistic and athletic kids who get dirty, really dirty and suffer from many allergies. The eco nuts brand really gets our clothes clean. Plus, our allergies were not an issue, our clothes feel great and have no irritating residue. I'm thrilled to use a product free of chemicals, eco friendly that really works. After doing the math I also realized I'll be saving a great deal of money using eco nuts. It's very economical costing only 12 cents a load! 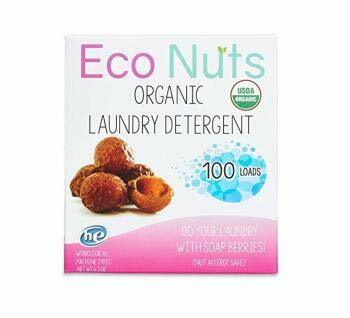 Eco nuts gets laundry incredibly clean with eco friendly nuts free of dyes, fragrance eliminating allergy offenders. Two reusable wash bags so you can do multiple loads at a time, laundry mats for example. This is particularly useful for the elderly, anyone living in an apartment or college kids who are eco conscious and don't want to carry big heavy bottles of detergent up and down flights of stairs to do their laundry. 100 loads of laundry can be washed per medium box. Would You Use Nuts to do Laundry? 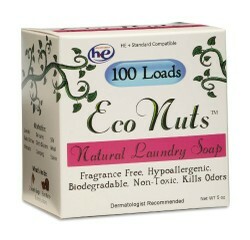 After having read about eco nuts envirnomentally friendly laundry soap would you use them? I always use eco friendly products, however, my son has recently developed an allergy to the brand I use. Chat about eco nuts eco friendly laundry soap. katiem2, Thank you for the product line! It's nice to find something fragrance-free. Their site lists dryer balls and floor, glass and surface cleaners. Do you have experience with any of them? We all need to detox our bodies on a regular basis. Learn the easiest way to maintain a healthy body and detox with all natural super foods that cleanse the body of toxins.